4.3 Any debug or test ports? 4.4 So what did we learn? The latest fad in our lab is the amazing Hubsan X4 H107L micro-quadcopter – cheap, fun, decent quality, and some of the coolest technology I’ve seen packed into something so small. This was my first brush with quad-rotors, and I think I’ve got the bug. Of course, no gadget is particularly interesting unless you can hack it, so the first thing on my mind was how the control protocol works. As far as I can tell, the earliest attempts at discovering the mechanics of the Hubsan protocol for the Deviation 3rd-party firmware for Walkera RC controllers. A great guide on how to implement the protocol, with some really good improvements to PhracturedBlue/the Deviation project’s A7105 and Hubsan protocol Arduino libraries in the comments. These resources were really helpful in getting my head around the protocol and interfacing the A7105 with an Arduino – but they were just a bit light on reverse-engineering detail and I wanted to know how this thing worked inside and out. The first step in reverse-engineering the protocol is to understand what the controller and X4 can actually do. This means flying and crashing it an awful lot (at the lab we just broke our last replacement rotor… so there’s that). Flying the quad-rotor is a lot of fun – but it takes a little getting used to if you’ve never flown one before. There are a ton of great tips in the manual on how to keep the thing in the air, and even do 360-degree flips. The Quadrotor has 4 flight control axis’ – Elevation, Yaw, Pitch, and Roll. It also has trim control on all axes in fine increments. With a push of the left stick, you can swap the control scheme to your preference. You can also calibrate the sensitivity of each axis too. The X4 also has 2 flight modes – “anti-flip” and “expert”. Anti-flip is the default mode and is relatively easy to control, whilst Expert mode allows much faster and greater range of movement. You need to be in Expert mode to perform a flip by applying a bunch of throttle then rocking either pitch or slide quickly from one side to the other. 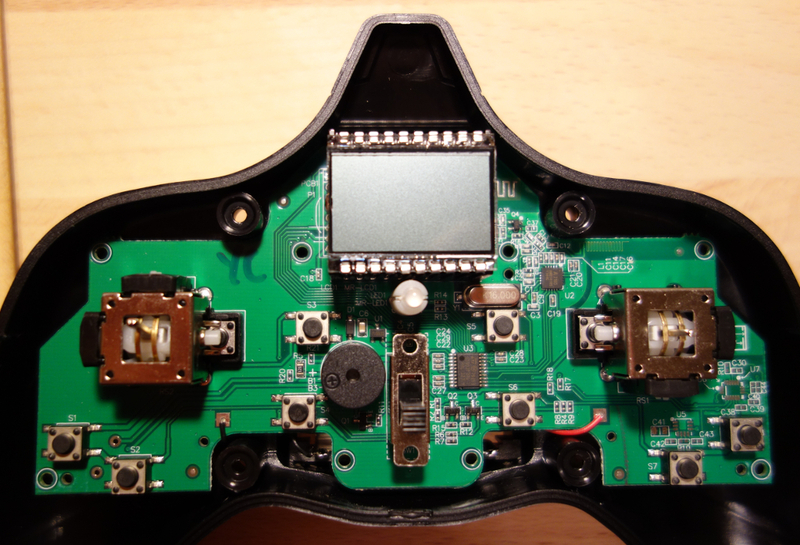 Binding the controller with the quadrotor is a matter of powering them both on and ensuring the quadrotor is on a flat surface (presumably for the internal gyro calibration). The lights on the Quad should stop flashing and you’re ready to go. If you kill the power to the controller mid-flight, the quad will just drop out of the sky. Similarly, if you power off the controller and then power it back on, the quadrotor won’t respond. The settings seem to be remembered between flights, even when the battery is pulled from the Quad –it seems unlikely the vehicle has any non-volatile memory. The controller is communicating constantly. Dropping the power on the controller results in an immediate loss of quad flight – it doesn’t hold station or perform a graceful emergency landing. The controller and quadrotor only bind once. Cycling the power on the controller once it has already bound to the quad results in the quad being unresponsive until the power is cycled on that too. The binding negotiation isn’t remembered between power-cycles. Expert mode/Anti-Flip mode is probably just a change to the calibration range or sensitivity of the controls. Watching a 360 flip in action, it looks like you have to use the quadcopter’s inertia by shifting it’s mass one way, then using it’s agility to rock the quadcopter into a roll in the opposite direction. As far as I can tell, this ability is provided purely by the power and agility of the quad’s motors. When reversing toy RC helicopter/quadrotors, we can almost always assume that the controller is going to do the lion’s share of the communicating. It will almost certainly be a lot easier to look at than the control board on the vehicle too. 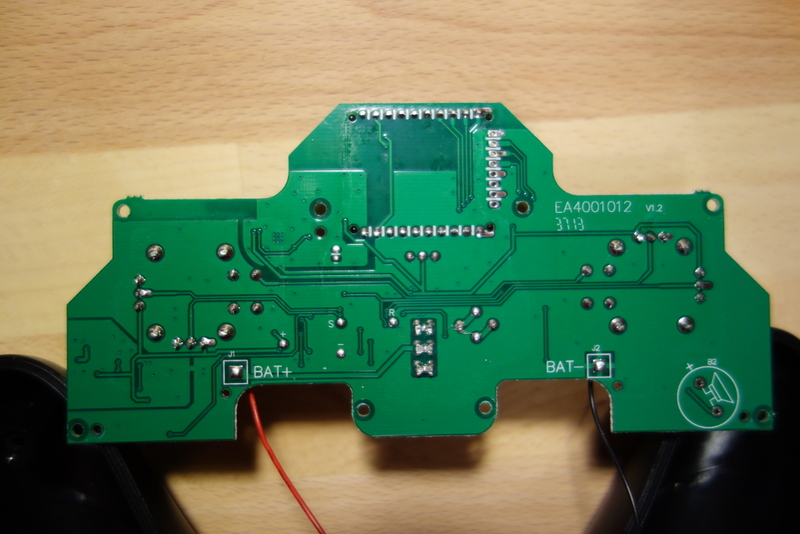 Taking the controller apart, we can see that there is a single PCB with all of the control input components surface-mounted directly on it. This includes the LCD screen, a bunch of micro-switches, 2 dual-axis thumbsticks, and the on/off switch. You might notice that there are no external antenna wires and that little pointy antenna nub on the molding of controller is purely for decoration. 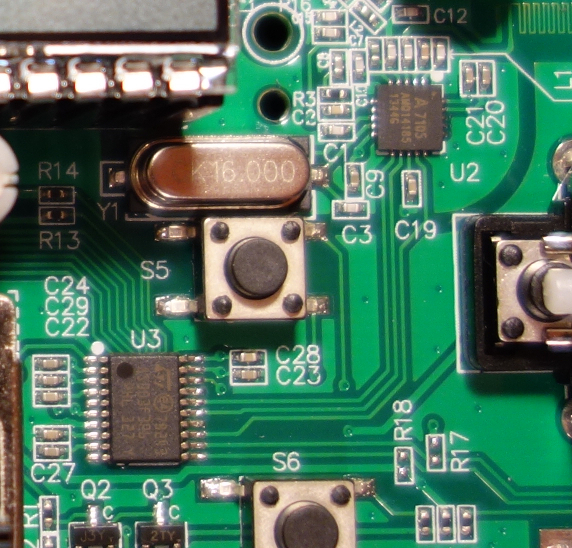 So we’re looking for the juicy bits – the main microcontroller, the RF hardware, and any debug ports/test access points that could be handy. The brains of this thing appear to be an STMicroelectronics STM8S003. This is the value line of the 8-bit STM8S series of general-purpose embedded microcontrollers. A quick glance at the marketing specs on page one of the datasheet shows that it supports UART, SPI and I2C communications. This kind of systems-engineering information is important to remember when we try and piece together how this thing works. 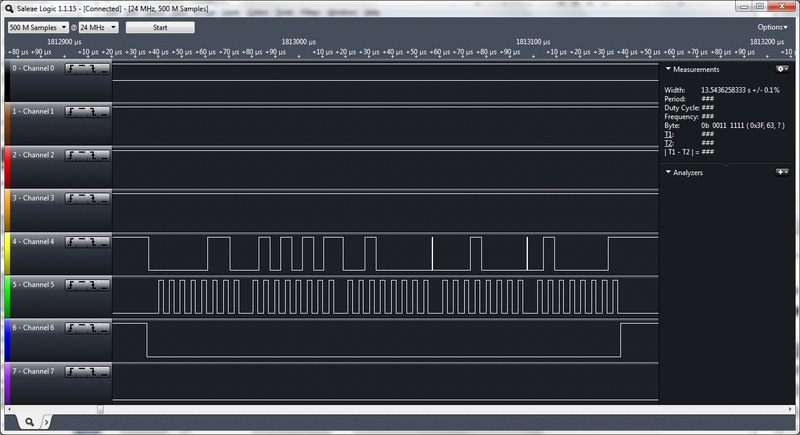 Unlike the big through-hole DIP IC in the Syma S107G controller, the MCU here is a small TSSOP20 package. This isn’t ideal, but it could be worse – if we can’t find a debug or test port, the IC pins are exposed so we could always solder some fine magnet wire onto them and sniff them that way. This datasheet isn’t quite as easy to read as the ST one, but it still tells us everything we need to know. The summary on page 5 tells us that it supports 3-wire and 4-wire SPI communication – this is perfect. Not only is SPI one of the communication protocols that our MCU supports, it is also widely supported by logic analyzers. Sadly, the pins on this package are inaccessible as it’s a tiny QFN package, so we’re stuck with reading the MCU pins or finding a debug port. Any debug or test ports? Now then – this row of unpopulated pads is interesting. 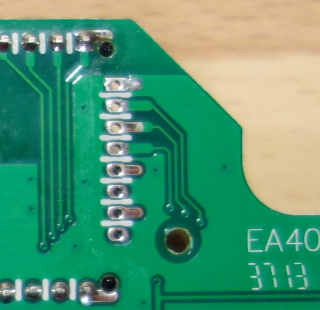 It looks like traces from all over the board run towards it – on both sides and apparently on different PCB layers too. That is a great indicator that this is a debug/test port. 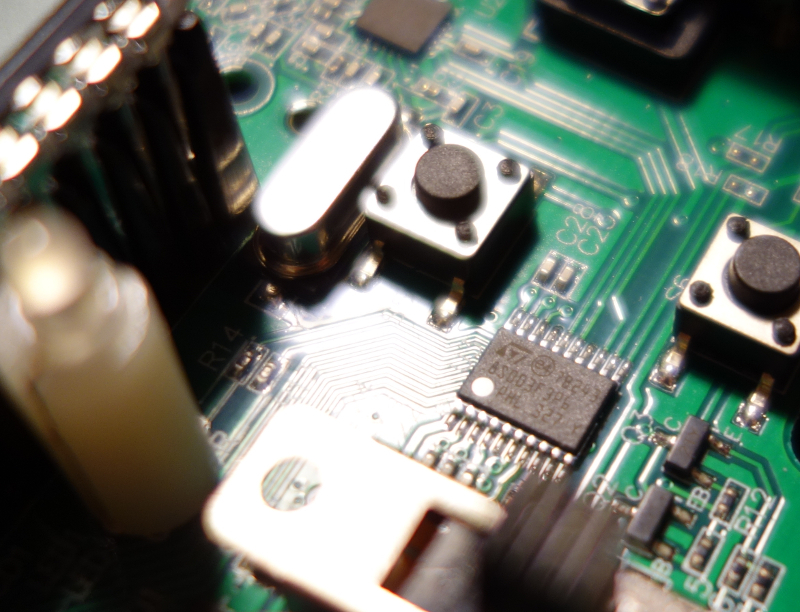 These kinds of ports are often used in manufacturing PCBs to aid in the efficient automated programming and/or testing that the assembled devices go through in the factory. 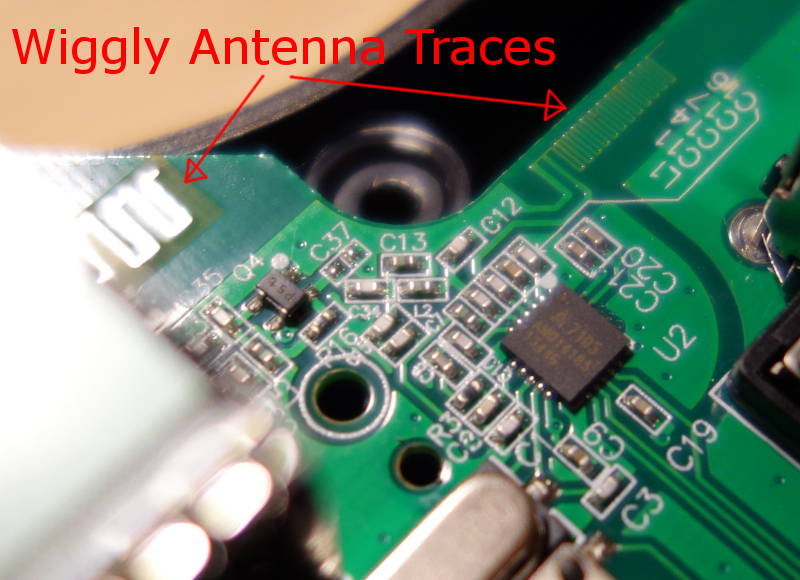 Such ports are a goldmine for reverse-engineers and hackers as they can be a window into the devices soul…or in this case maybe the communications bus between the MCU and the Transceiver. They may be distributed across the board as a constellation of test pads (ready to be probed by a bed-of-nails test jig) or closely grouped like this one. The Microcontroller is an STMicroelectronics STM8S003-series 8-bit processor. It is a TSSOP20 package, so we have access to the pins directly if necessary. It supports UART, SPI, and I2C communications protocols. The RF part is an AMIC A7105 2.4GHz Transceiver module. It can be controlled over 3-wire and 4-wire SPI. 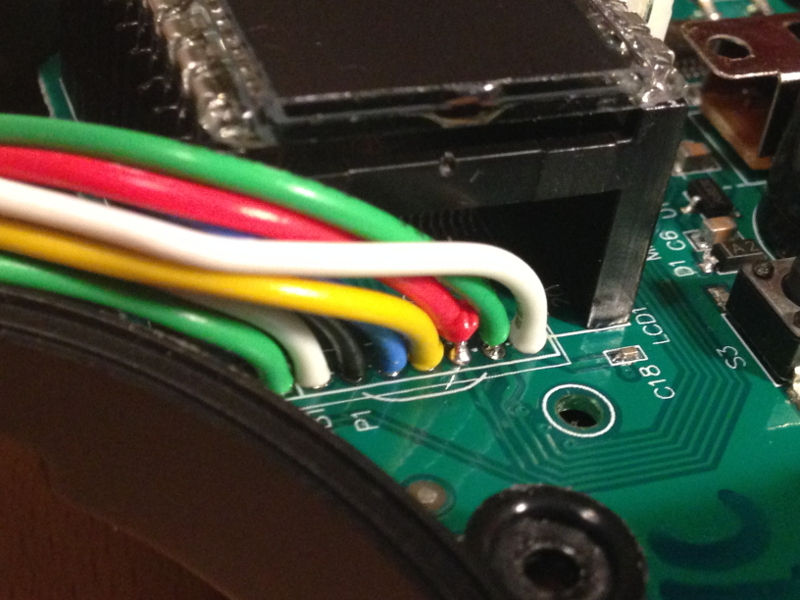 There is a promising-looking set of unpopulated pads on the top-left of the board that look like a debug/test port. Here we can see a clear communications bus between the MCU and the Transceiver chip. As we have the Datasheet, let’s take a look at what the MCU pins connected to the bus traces do – counting from the pin marker dot at the top left, we can see the connected pins are 13, 15, and 16. 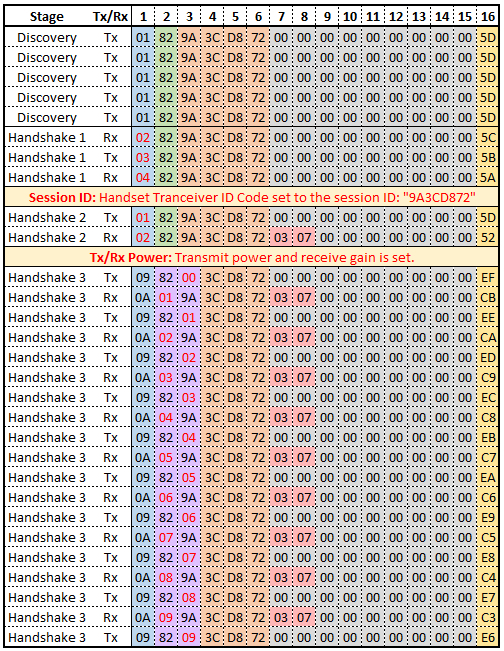 Page 21 of the STM8S003 datasheet shows the pinouts for the TSSOP20 variant of the chip. We can see that pin 15 is “SPI_SCK”, pin 16 is “SPI_MOSI”, and pin 13 is “TIM1_CH3”. This is all we need for 3-wire SPI, so now we know exactly which pins to sniff with the logic analyzer if need to, and a good idea about what they will be doing. As we’re interested in the data at a protocol level (we already know it must be SPI), we’re going to want to probe the test pads (or failing that the MCU pins) with a logic analyzer. Ultimately we want to design a test regime that will allow us to empirically manipulate the controls in isolation and observe the output. Understanding the relationship between changes to a given control axis and the resulting changes to the protocol data is crucial to reversing the protocol. But first we need to get access to the test port while still being able to fly the quad – this means breaking out the test port. What we need is a makeshift extension for the test port to make it accessible from outside the controller’s case. Ideally it should terminate in some kind of connector that makes it easy to access each pin individually, mitigate the chance of accidental short circuits, and help keep your work tidy. As the pointy “antenna” nub part of the case is purely decorative and the test port is nearby, I think this is a good place for us to make a hole for the breakout without worrying about other components or structural parts of the case getting in the way. We’ll start by drilling a hole in the controller casing with incrementally increasing-gauge bits (starting with a small bit and getting larger reduces the chance of the plastic cracking and make it a bit easier to get a clean cut). A 6.5mm bit looks like it is wide enough to feed the 9 wires we’ll need through (8 test pads + GND reference). Next let’s cut 8 pieces of insulated wire long enough to reach from the test port pads out through the hole in the case we drilled (to common length of about an inch outside the case). 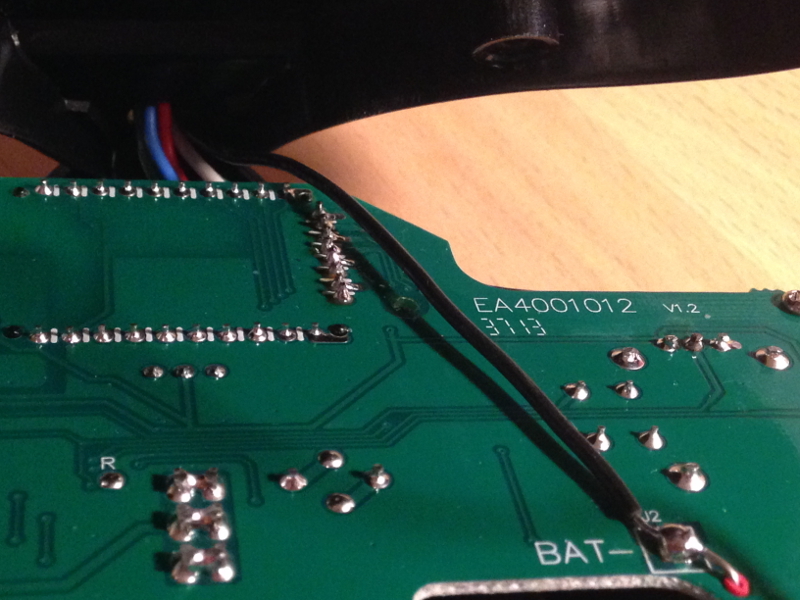 These are easily stripped and soldered onto the test port pads. Very important! It’s essential we make a note of the order that breakout wires go in from top to bottom – we’ll be soldering them to the breakout connector in the same order. This is very important if you have multiple devices or communications buses broken out to the test port – you’re going to want to know which pin is which! 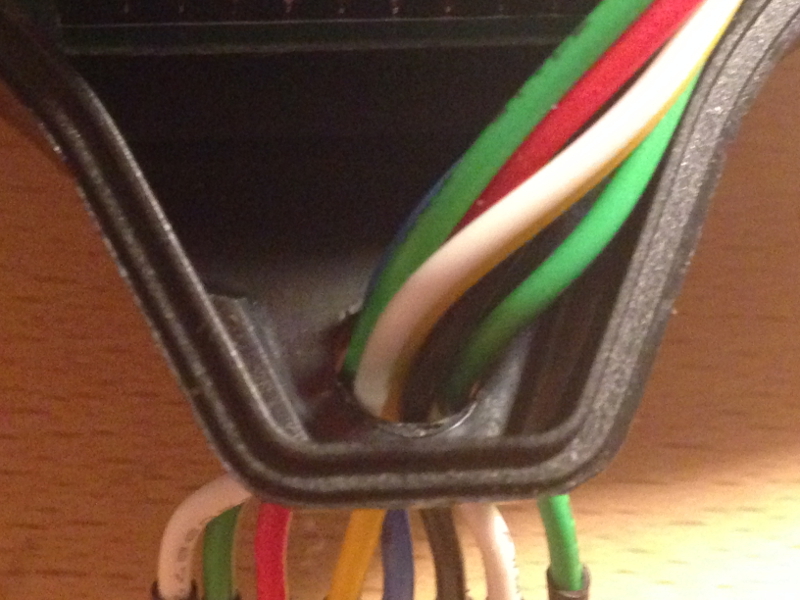 We also want to run a wire from the negative terminal of the battery compartment out through the hole too. This will be our ground reference for voltage and logic measurements. 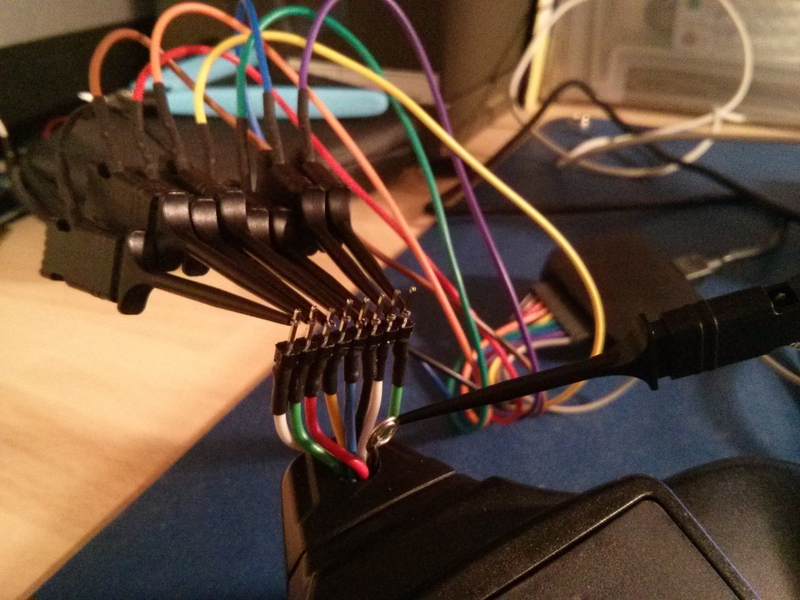 Next we want to solder the wires (in order) to the breakout connector of choice. I really like using standard 0.1” pin header for this – it’s super cheap, easy to grab with probes, and not too hard to solder wires to. With a bit of flux, some Helping Hands, and some heat-shrink tubing, you can have a really nice and discreet breakout in no time. We’re almost ready to start sniffing for protocol data, but first we need to do a bit of due-diligence to make sure it’s safe to connect the logic probe. As with the Syma S107G, I’m going to be using my trusty Saleae Logic 8. The Logic 8 has a maximum input voltage of 5V, so we’re going to want to make sure none of the test points exceed that at any time during our testing. NB. The Saleae Logic 8 doesn’t have great input protection, so I’m always a bit paranoid about this bit. Apparently the Logic 16 has much better safeguards against over-volt inputs. To do this we can use a digital multimeter to monitor the voltage-level of each pin – in this case, we want to make sure the voltages don’t change after the controller has bound to the quad too. To ensure we can accurately and fully sample the protocol we need a sample rate of at least that of the expected communications protocol. 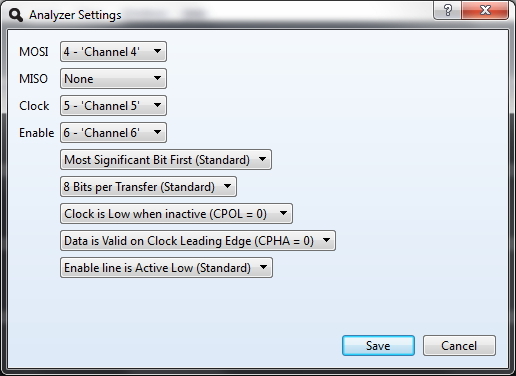 From the A7105 datasheet (in the SPI Timing Characteristics section), we can tell the maximum possible clock rate supported for the SPI input is 10 MHz. Let’s configure our capture with a sample rate of 24MHz for 500 million samples (giving us a capture window of 20.8 seconds). Image provided courtesy of Wikimedia Foundation. 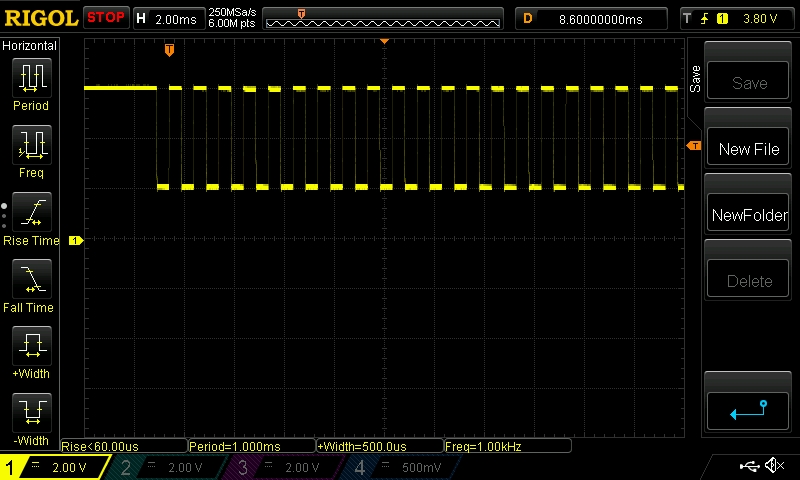 The SPI master (usually the MCU) provides the oscillating clock signal for the bus. When we want to send a 1 or a 0, we pull the Master-Out-Slave-In (MOSI) or Master-In-Slave-Out (MISO) line HIGH (for a 1) or LOW (for a 0). The state of the MOSI/MISO line at the rising or falling edge (which one depends on implementation – check the datasheet) of each clock oscillation is the bit value that is transmitted. The Master signals that it wants to communicate with a Slave device by pulling the Chip Select pin (SS above) LOW (the default inactive state is usually HIGH for Chip Select). 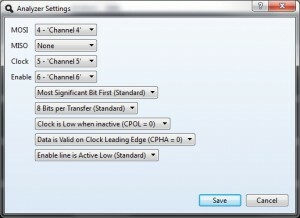 For more information about SPI, see http://en.wikipedia.org/wiki/Serial_Peripheral_Interface_Bus. Channel 5 – This one immediately jumps out as a clock signal – it’s regular and is apparently grouped into 8 oscillation sets (8 oscillations, 8 bits = 1 byte?). We can also tell from the period of the oscillations that the apparent clock rate is about 235kHz. Channel 4 – This one is much less regular than Ch5 and often transitions in the middle of Ch5’s oscillations. That sounds a lot like a MISO/MOSI data line. Channel 6 – This one just goes LOW for the duration of the transmission – looks just like you’d expect a Chip Select line to look. Saleae Logic’s software package has built-in support for SPI protocol decoding. Let’s configure it with our guesses about the channel types. We’ll leave the other values as default for now – we can always check the datasheet if we have problems. 0x06 = Command: write to ID Code (hex 06) control register. 0x55201041 = 4 byte/32-bit ID code data value. More on how this is done in Part 2, but for now we’ve confirmed that our methodology is good: we now have a way to observe and record all communication between the MCU and transceiver, and we’ve just observed the MCU configuring the Transceiver’s ID code (and much more in the rest of the capture). In Part 2 I’ll cover how to devise a test regime to generate good data and how to logically dissect the captured traffic – hope you found this informative, and if you have any questions please leave a comment below. Thank you for sharing Jim ‘ung ! It reads like a thrilling detective novel ! May I ask you what is your major ? How did you get such skills ? Hello, I’m trying to control my hubsan x4 with my computer, but using a different software…. Maybe your experience can help me ? As you can see, at the beginning, the Hubsan blinks normally : he is searching for a remote to which he can bind. The two blue led start blinking together, does someone recognise this pattern? That’s an interesting problem – I’m not familiar with that project, but I’ve taken a quick look at the code to see if I can see the problem. My first guess was something straightforward like the throttle control value not being initialised correctly (it has to be zero otherwise the quad won’t accept control signals), but from the look of your video it doesn’t look like the script is getting to the end of the bind() function in hubsan.py. My guess is that it’s failing somewhere in the escalating handshake – there is an issue posted to the github repo where the author mentions in a reply that it may be a timing issue causing the fault. I’m going to publish my own code to Github as soon as I get a chance, but in the meantime try changing line 5 of test.py from “logging.basicConfig(level = logging.INFO)” to “logging.basicConfig(level = logging.DEBUG)”, then run it and post the terminal output on here for me to take a look at. Hmm, your debug output makes it pretty clear that you’re right about the MODE register check – the A7105 doesn’t seem to signal that it received a reply in the period that it’s listening. In my tests, the X4 responds in about 3 or 4 milliseconds, so the 15ms in the code should be adequate. You seem to be receiving a \x1A in the MODE register after transmitting, which means it sent successfully (you have a 0 in the TRER position, bit 0). 1: Enable. It will be clear after end of packet encountered in FIFO mode. It seems like the quad just isn’t responding to your binding beacon, and if you’ve tried extending the amount of time to listen for the response and still have no luck, then I think we can be comfortable that it’s not that we’re just missing the response. 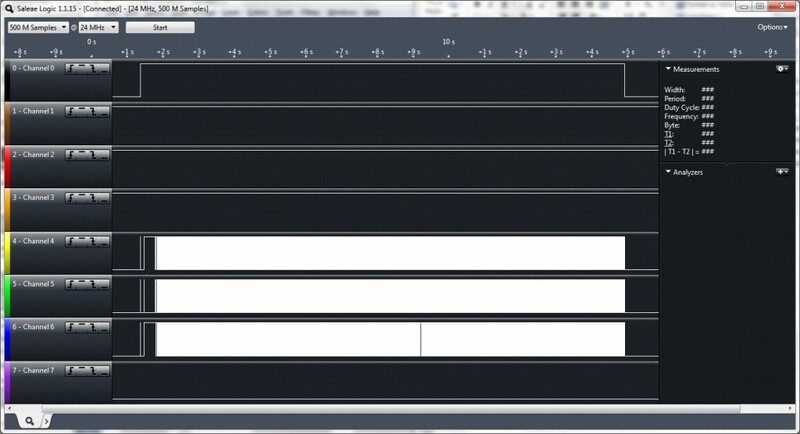 // Cycle through the 12 channels and identify the best one to use. a7105.writeRegister(A7105_0F_PLL_I,_channels[i]); // Set PLL Register 1 - Select Channel Offset. Hello, i have a question what is for the Symbol of the speaker on the back of the PCB ? What can i connect to it, and it is possible to put a high range antenna ? I’m looking for a way to connect the controller to my PC as a controller for Quadcopter Simulator. Do you have any ideas how to do this? – Make a PC interface controller using a Teensy board that measures the controller potentiometers and buttons, and translates that for an emulated USB HID Joystick (the Teensy makes this really easy). This would convert the controller to a wired controller (you’d need to connect to the controller via USB). I think this is probably the easiest and cheapest way. – Build a receiver (exact same hardware as my controller from Part 4 – http://www.jimhung.co.uk/?p=1704) and program the Arduino Due to perform the Quadcopter-side of the binding sequence (including scanning the open channels for binding announce packets), then decoding control packets to extract the control values. The Arduino Due is also capable of emulating USB HID joysticks/keyboard/mouse so that’s how you would interface it with the PC. This approach is harder and probably more expensive, but requires no modifications to the controller. What Quadcopter Simulator do you have in mind? I just took a quick look at FPV FreeRider (https://fpv-freerider.itch.io/fpv-freerider) which seems like fun – it looks like a hacked controller would work well too. I could buy game controller, but it would be too easy way. I’ve never used arduino, I have some experience with C++ and I like doing somethimg by hand. If I get success, I’ll report here. Thank’s for a lot of information which you shared. My Hubsan H107L just does not bind with the transmitter anymore, what can I do? The LEDs just keep blinking. Hello, I am trying to add a 5th servo motor to my Hubsan x4. Is there a way to add an external switch to the controller to independently control a 5th servo motor? There are leads on the flight controller that don’t have any apparent use. Can I transmit a signal to those leads?